World War II, the largest and deadliest conflict in human history, is widely considered the pivotal event of the modern age. From the rise of fascist Europe to the atomic bombings of Japan, Encyclopedia of World War II presents the complete story of this great conflict in more than 700 entries. 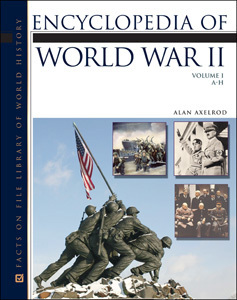 International in scope, this two-volume A-to-Z reference covers the military, historical, political, diplomatic, and biographical aspects of the war. "...a good choice for public, high-school, and undergraduate libraries." "...sure to be an excellent research tool for students and general readers...accurate and detailed enough for an academic audience, but its ease of use and clear writing style make it appropriate for public and school libraries as well." "...extensive research and attention to detail...this relevant and informative introductory resource provides exemplary general coverage that can hold its own against other works on the subject."